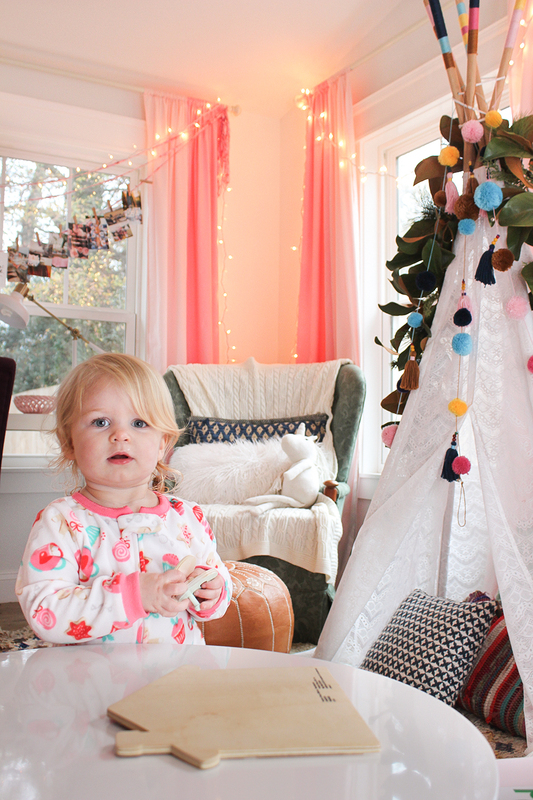 This is a special little place for us and I had a blast Christmassing it up for our girl. 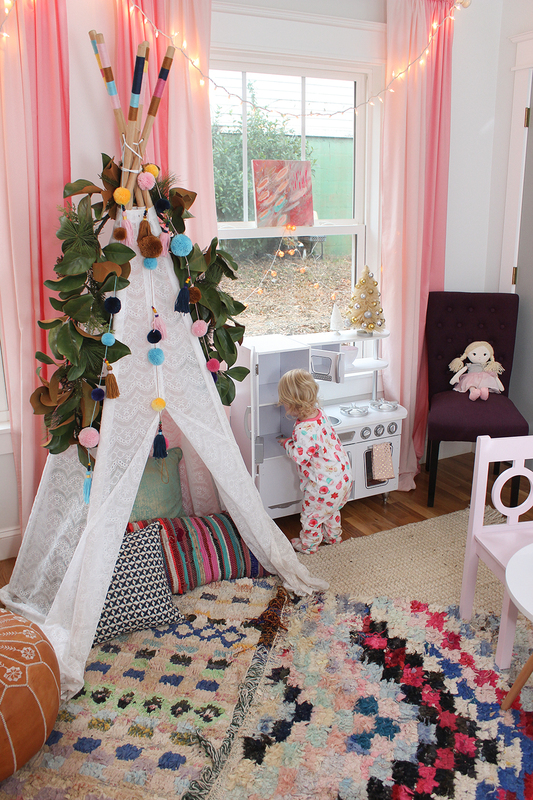 Rosie was born at the end of January, so that Christmas when we knew a little girl was joining our family in just a month, I had a blast collecting some Christmas girlie things I knew we’d put in her room or space for years to come. All of those made an appearance in here this year! There are a lot of photos and a lot to share on this post! So for room details, make sure you check out the official playroom post. I’ll just be sharing the Christmas decor today. 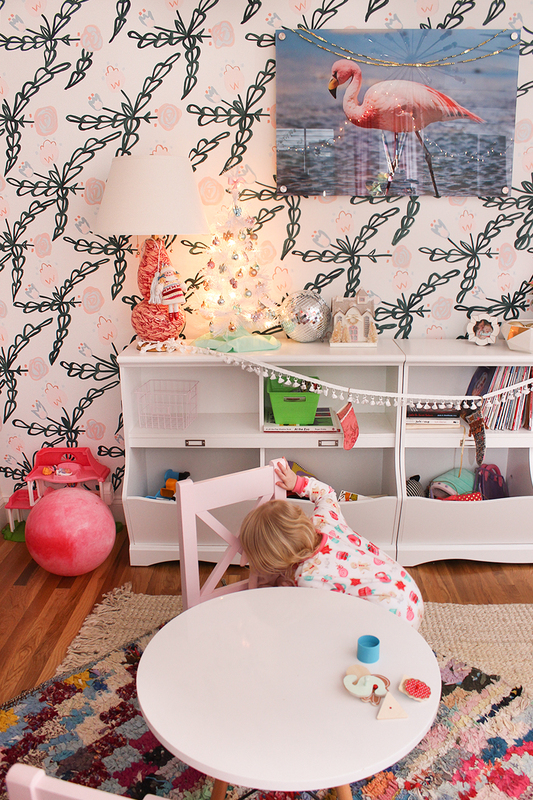 Her storage console was the prime spot to decorate. 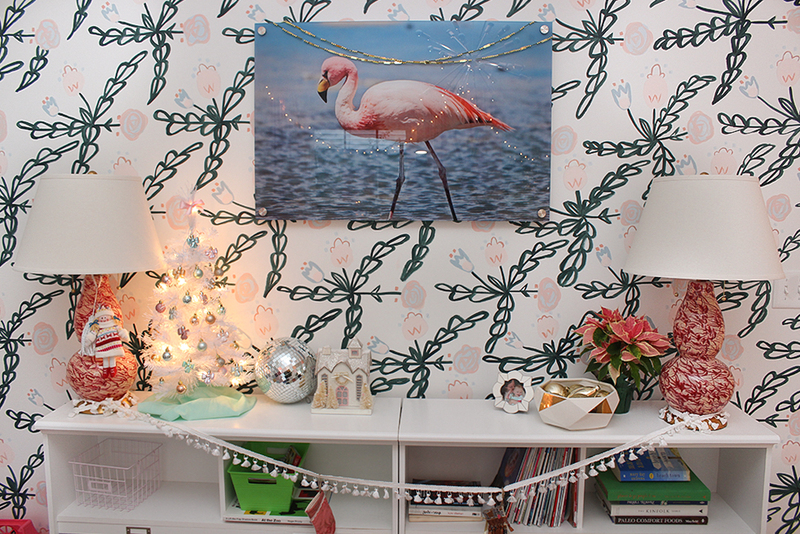 The flamingo got a little glitz with a gold beaded garland we had on hand. I hung a tassel and a sweet little Christmas doll from the lamp. We got this little doll ornament for Rosie in her stocking the year we were expecting her. It’s so sentimental to have out. 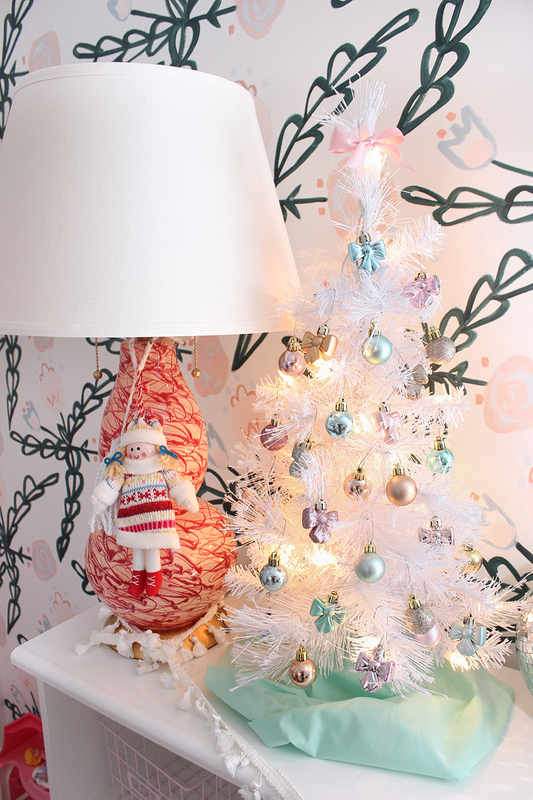 I did a little white tree with some sweet pastel ornaments. 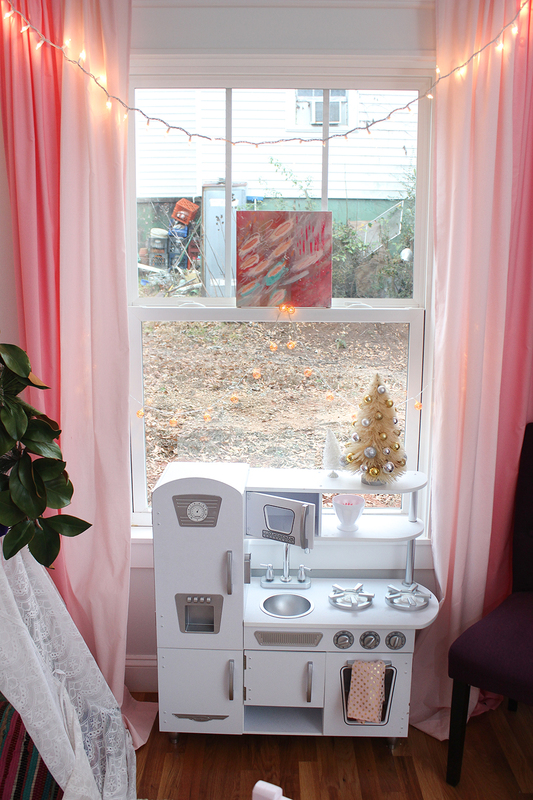 I got this sweet little house this year to sit out in her space each year. I love having some sweet things to get out each year that she’ll remember. 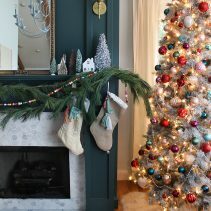 I strung a piece of tassel fringe between the two lamps and hung two little stockings on it. I got those stockings at a holiday fair the year we were expecting her. Rosie will have to learn to share when her little brother comes along. In here, she has one chair and “Bubby” (her bunny best friend) has another. We hear “Sit Bubby,” throughout the day and she puts her little friend in this chair. Then she reads to her or talks to her and tells her about toys. She was in here playing while I was photographing the room and she ran over there to give Bubby a kiss. 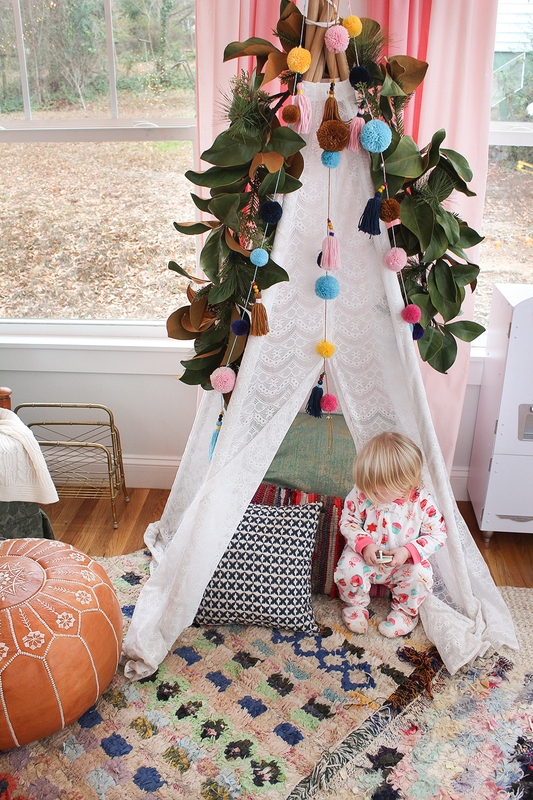 The biggest change in this room came from moving the teepee from the corner to the center here. This green chair had to be displaced to make room for a Christmas tree and we had nowhere else to put it. This chair was my grandmother’s and actually matches the peach one in our living room, but at one point, she had them reupholstered in different fabrics for different rooms. The peach one works so great in our living room, but I’ve really just been hanging on to this one so that I could reupholster them one day as a pair. But it really needed a permanent home. This was temporary, but now, I’m loving it in here! It will definitely be staying. It fits perfectly back in the nook by my desk. 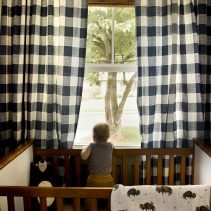 And I’ve finally discovered my “spot.” I’ve been looking for that perfect spot in our house to sit each morning that’s kind of out of the way to drink my coffee and have my quiet time. And this is it! I’ve loved my mornings in here. Plus, I love having a comfy chair to sit in while Rosie plays. It isn’t as easy to lounge on the floor with her these days, especially for as long as she likes to play in here. 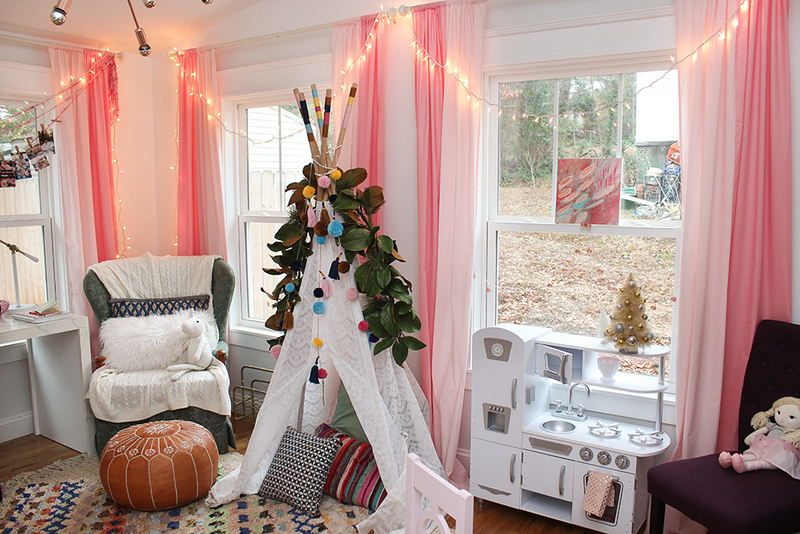 I made the upholstery work for us for now just by throwing a blanket, some pillows, and Rosie’s little unicorn on it. And the green is actually in the boucherouite rugs, so that’s a plus. It’s my special little spot. And I’m actually loving the new layout of this room! I think the twinkle lights on all the windows are my favorite Christmas touch in here. They make it feel so magical! 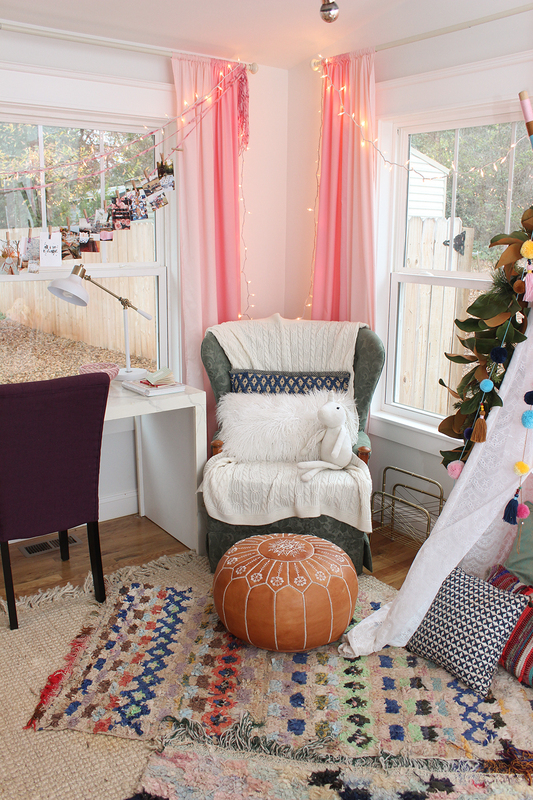 Each morning when I sit in here, I enjoy my coffee and read by just twinkle lights and a lamp and it sure starts my day off right. 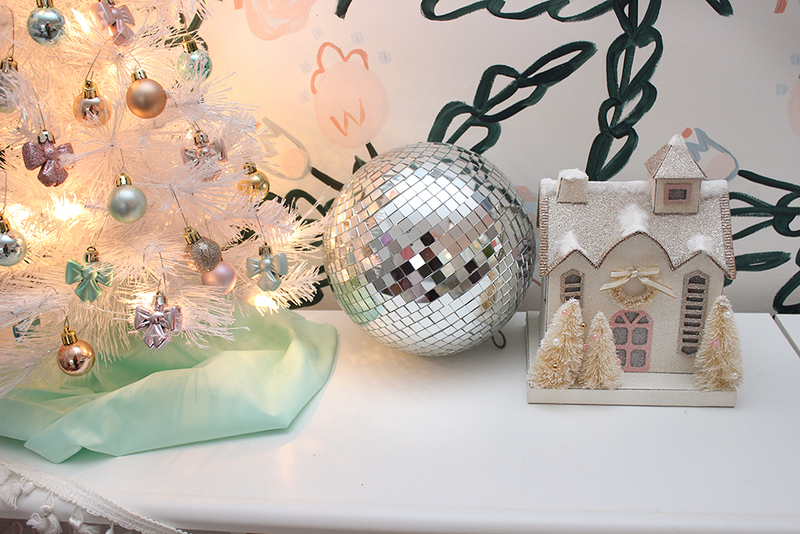 Who says twinkle lights are just for Christmas? These babies will be staying. 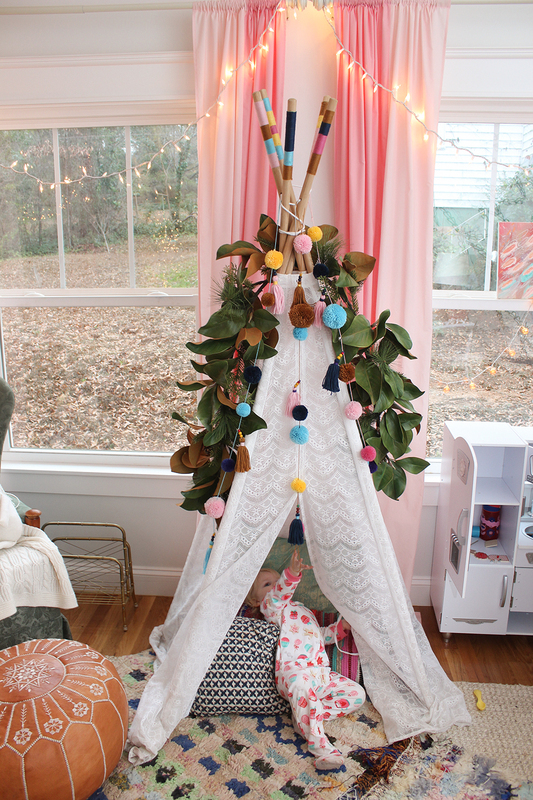 I draped my faux magnolia garland over the teepee for a little touch of Christmas. I’ve never liked this space so much. Can it be Christmas all year long?? 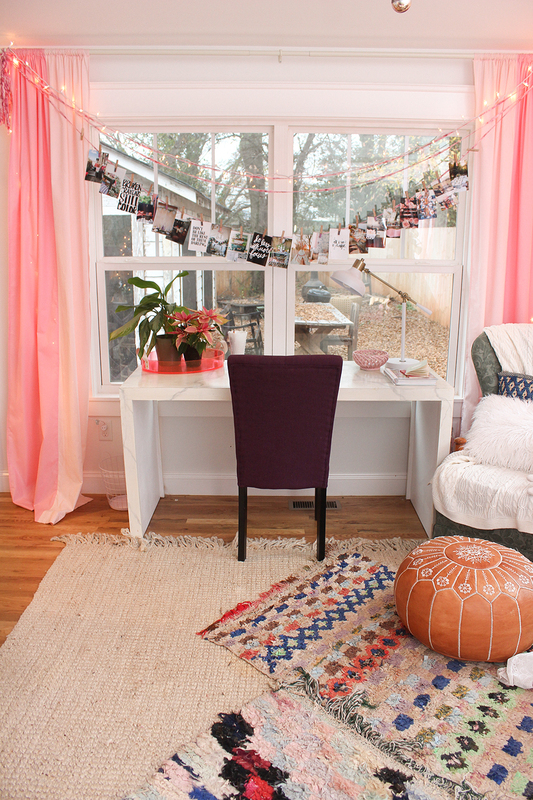 Finding a spot to sit and sip coffee in the morning is key! That chair looks like such a cozy place. Beautiful, as always! 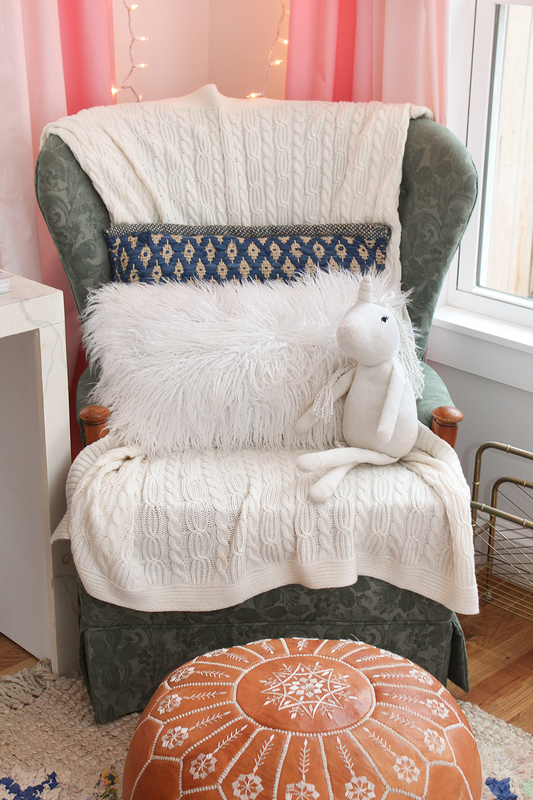 Product question: Where did the blue and natural patterned pillow (the one behind the furry one, if that wasn’t a good description ha ha) on your grandmother’s chair come from? Love it!